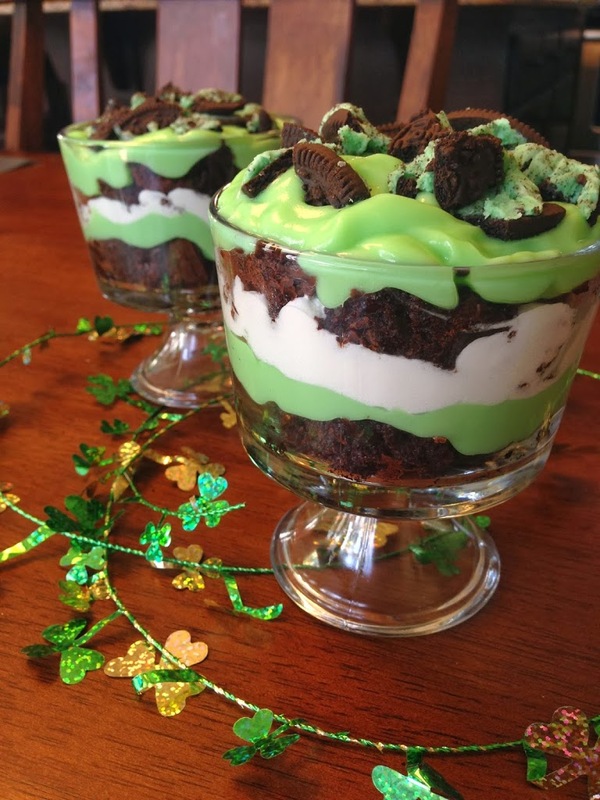 With St. Patrick’s Day coming up, I decided to make these festive trifles. I had gone to my grocery store and found mini trifle bowls. They were too cute to pass up, especially since one of my favorite desserts to make, is a trifle. I looked around my pantry, found some basic ingredients and threw these together in no time. Not only were they a huge hit, but they were just the right amount!! 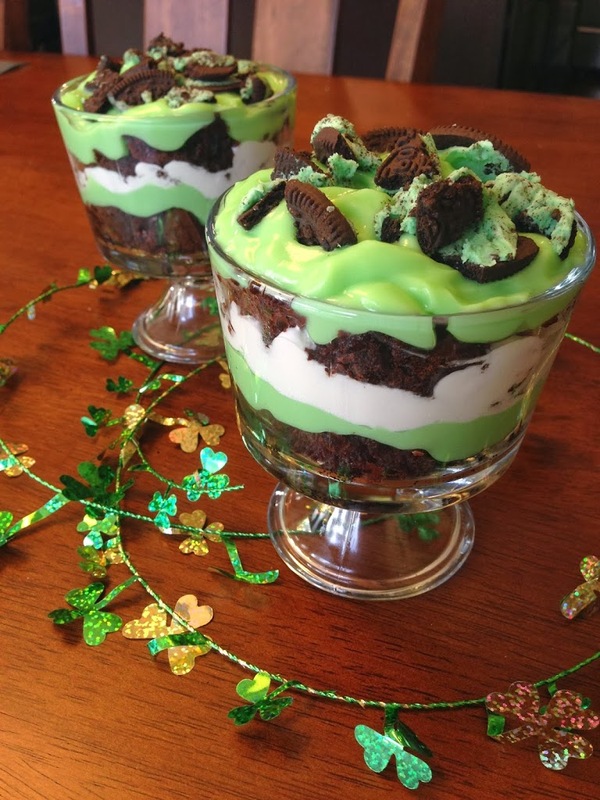 If you are looking for a delicious St. Patty’s day treat, look no further!! This can be made in a normal size trifle bowl, or mini dishes, totally up to you! Cook brownies according to directions. Allow to cool completely. Make pudding according to directions. Once pudding is done, add in a few drops of green food coloring, or until desired shade of green is reached. Take a Ziploc bag and place a few Oreo’s inside. Seal the bag and smash the bag to crush the Oreo’s. To assemble trifle; layer cut up brownie, a layer of pudding, a layer of cool whip, another layer of cut up brownie, a layer of pudding, and a few crushed Oreo’s on top!! Chill in refrigerator until ready to serve!! *You can also use pistachio pudding if you don’t want to use food coloring! How delicious and easy is this beautiful dessert. Pinning/sharing this weekend. Made this for our Bible study group’s St Patrick’s Day dessert this evening and it was a HUGE hit with everyone. I didn’t have mint Oreos, so I covered the top with chopped-up Andes mints. I ready enjoy your blog; you always have awesome recipes! A friend of mine made this Sunday at Church it was Awesome! !! Thank you so much for the fun recipe. My husband treasures his Irish roots, so we are having a St. Patty’s Day dinner tomorrow but my mother-in-law didn’t leave any recipes behind. I had never had trifle before meeting him, so to honour my mother-in-law, I am adding Bailey’s to the brownies! Awww what a fun evening you have planned! Great thinking on the Bailey’s! Hope all the yummy food turns out great and you enjoy these trifles! I made this today for a fun St . Patricks Day treat and my family loved it. Thanks for the recipe. Oh fun!!! So glad it was a hit! Hope your family and you had a wonderful St Patrick’s Day!! Just thought I would leave this update. I used a pkg of 2-bite Brownies because I didn’t want to take the time to make my own. I used 2 ounces of the Bailey’s to soak the cut up brownies in while I was making the pudding. I decided to use White Chocolate Instant Pudding. This recipe is SO delicious, my family is still talking about it. I’m going to keep the recipe in my Pinterest files, use eggnog to make the Vanilla Pudding and dye it red, add rum to the brownies and make a Candy Cane Trifle for Christmas! YUM!!!! The Baileys sound amazing with this!! Great job!! I am so glad you enjoyed it and will be making it again!! Have a great day and thanks for the update!!! I added crushed mint Oreos to the brownie batter and a layer of crushed cookies throughout the trifle and it gave it an even more yummy flavor and texture! Super easy and great recipe, thanks for sharing! Ooooo great thinking! I’ll have to remember that for next time! Glad you enjoyed it!! Happy St. Patty’s Day!! Did you double everything? While dessert was wonderful it did not look like yours. Nope, I didn’t double this recipe, however, I did use mini trifle dishes for the picture. Did you make one large trifle or mini’s? I used gluten free brownies, made my own cool whip, one box of pistachio pudding (wish I had used two), and Andes candies. Very good but not enough pudding. Great idea on Pistachio pudding, yum! Since I used mini trifle dishes, I didn’t run into the shortage on pudding, but I will be sure to add that into the recipe so people use two packages if making a large trifle. Thanks!! Hello, i wanted to know do we beat/whip the white cream or just layer directly form the box. Also can we use China grass (pistachio flavor) will it stand well? Hi! You beat the white cream and then proceed to layer! As for using pistachio, that works great!! Enjoy! Oh absolutely! I typically get about 12-16 servings out of this! You’ll love it! The amount of pudding as suggested in the recipe is not nearly enough to make the dessert look like the picture. I would suggest doubling the pudding amount so it does not look skimpy! I made these into mini trifles, only 4, so it worked out great! If making a large trifle, I agree, use the bigger box OR double up and use two boxes so there is plenty to use! Thanks!